After my fun experience making tiny poached quail eggs a few weeks ago, I jumped at the opportunity to try goose eggs. I also found these at a Whole Foods, this time from a local goose farm. Now all I need to do is find fresh duck eggs – unless there is another egg I’m not thinking of. Have you ever tried any interesting kinds of egg? 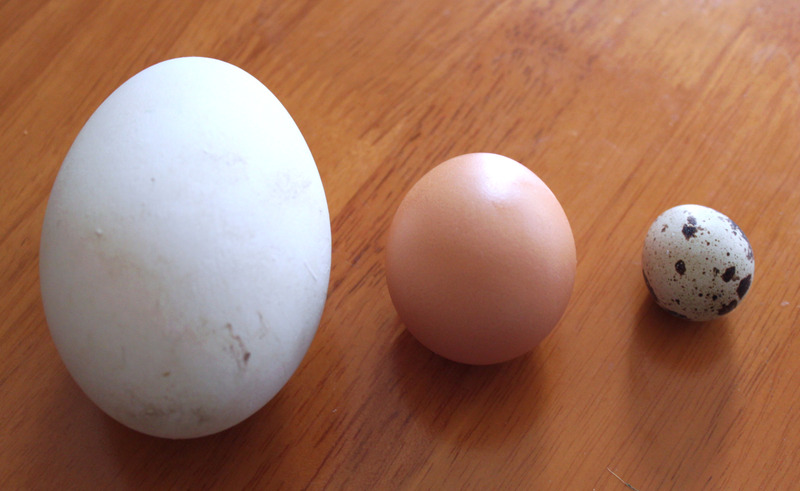 The goose eggs were really expensive and huge (see right for size comparison to chicken and quail eggs), so I only bought one. One goose egg can easily feed 1, maybe 2, people. They are richer than chicken eggs and have huge yolks (see left). The white part (which is actually clear) is much thicker and firmer than the whites in chicken eggs. I read that this can cause them to turn rubbery if fried, so instead I chose to make a French omelette, which isn’t cooked quite as long as American omelettes. I kept the fillings simple, as the goose egg itself was the focal point for me, but feel free to add your favorite omelette toppings. Yields: 1 serving. Easily doubled to serve more. Crack the goose egg – this may be the hardest part! Whisk thoroughly with salt and pepper. Melt butter over high heat in a small frying pan. Pour egg into pan once the butter has foamed. Let cook for a moment, then stir egg in pan with a spatula, bringing the egg on the sides of the pan into the middle so everything cooks evenly. 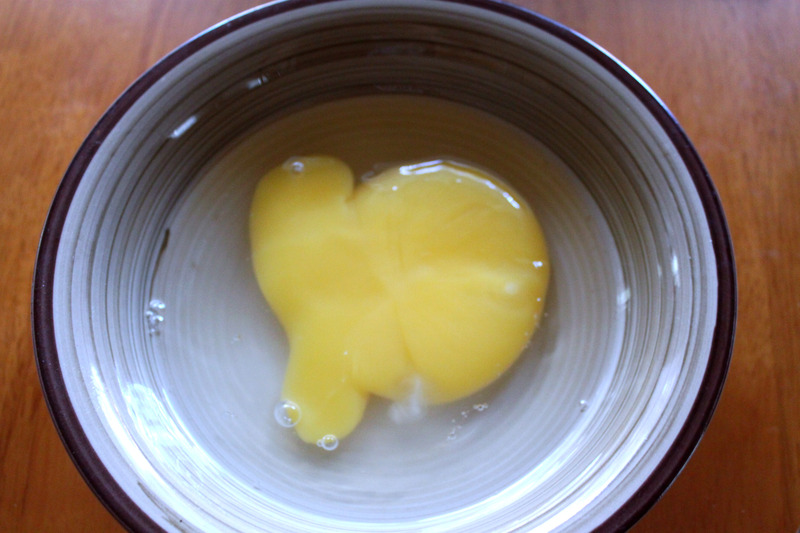 Once egg is just barely set, and still a little wet on top, loosen it from sides of pan and place onto a plate. 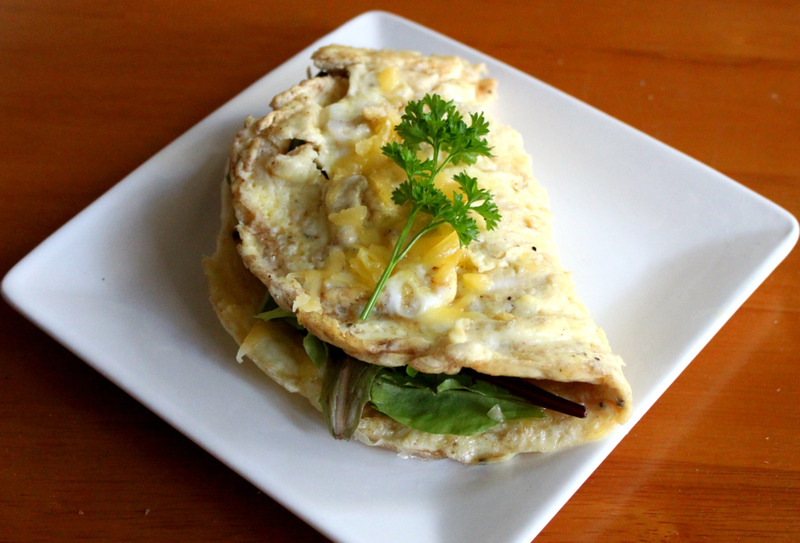 Sprinkle cheese and spring greens in the middle, then fold omelette over. On top chef last (?) season someone got an ostrich egg at whole foods and they totally got dinged for making a really rubbery omelet with it, if I remember right! So: ostrich? I don’t know what you could do with an even more rubbery egg tho. Poach it?? Soft-boil it and serve with baguette-sized toast soldiers in an eggcup the size of a colander? That sounds like fun actually!